Kanye West seems to be recovering nicely after falling ill at his own concert earlier this month. He’s about to kick off a five-night stint in California, then he’ll basically be performing through the end of the year. Clearly, this is a man who bleeds—or at least endures nausea—for his fans and art. That kind of dedication is usually the stuff of biopics, but not for West. If and when his life is dramatized for the big screen, the Life Of Pablo rapper wants a humorous take on it. 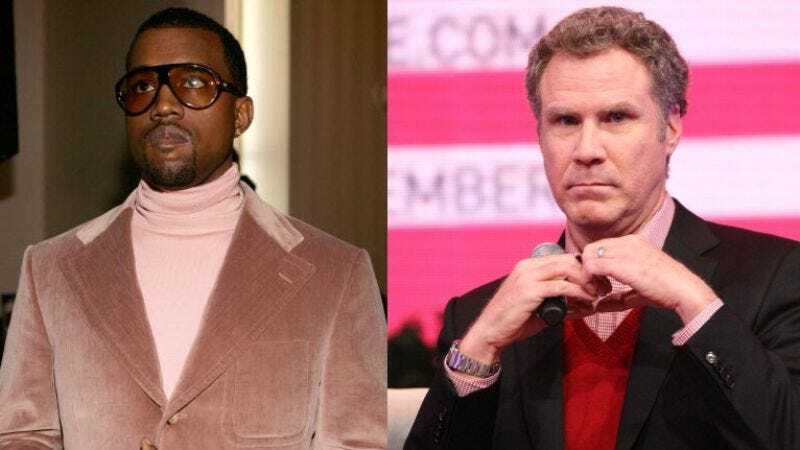 That’s according to Metro, which cites a Daily Star report that West not only wants a comedic biopic, but he wants Will Ferrell to play him in the film. The U.K. publication’s source is supposedly a Kanye West insider, who claims that the platinum-selling artist is eschewing a preachy rendition of his life in favor of something that will make people (intentionally) laugh. And Ferrell—who had West join him in a journalist brouhaha in Anchorman 2—is purportedly the man/exalted being for the job. West, who’s declared himself a god on at least one occasion, gave Ferrell deity status in a tweet back in February, so it’s not hard to see why he would feel comfortable having the actor play him. He also just seems to be a really big fan. Frequent Ferrell collaborator Adam McKay is supposedly in talks to direct the biopic, which is not even in preproduction, so take this news with a grain or two of salt. But given that Joseph Fiennes is set to play Michael Jackson in a 9/11 dramedy, there’s no reason this Ferrell-as-West movie can’t get off the ground.